The weather warmed up today but I’m not feeling great and so I decided to try a light pudding more suited to a hot summer day. It is called Orange Pudding and appears int he Pudding section of the 1898 New Galt Cook Book. Mrs. James Hood shared this recipe. I cut up a lemon very fine and put it in a pot on the stove. I added 2 cups of white granulated sugar and then poured 1 pint (2 cups) of boiling water over top. I put 3 tablespoons of cornstarch in a cup an added some milk until the starch was dissolved. I poured this into the pot and stirred. I turned the heat up until it boiled. . . . and then forgot about it! It boiled rather than simmered for more than the required 5 minutes but didn’t seem to come to any harm. I set it aside to cool and started slicing up oranges. I put the orange slices in a bowl and sprinkled powdered sugar on them. Once the cornstarch mixture was cooler I poured it on top. Since I’m not feeling all that well I decided to skip the raw egg white topping. I’ve made this sort of thing before and have a sense of how it will taste. However, if you want to go ahead as a modern cook you can get a carton of pasteurized egg whites and measure out the equivalent to two eggs. Whip them up well and add a bit of sugar and lemon flavouring before spreading on top of the pudding. Put it in the fridge to cool. I sampled it while it was still a little warm. Mrs. James Hood is Margaret Ramsay. She was born in Scotland around 1850 but her parents Andrew and Margaret brought her to Galt Ontario by the time of the 1851 census. Based on the 1861 census her mother died before Margaret was ten. Her father Andrew was a tailor and an 1851 directory lists him on North Main Street in Galt. I’m not sure where they are in 1871 but 21-year-old Margaret marries 31-year-old merchant James McCrea Hood in 1872 in Galt. They had three children the youngest was born in Galt in 1884 so they must have been living there at the time. In 1911 the family lived at 7 State Street. James died in 1925 but I don’t know when Margaret died. I sampled my orange pudding while it was still a bit warm and it was good. I was surprised. The only thing I’d change as a modern cook is to either strain the lemon or make sure it is very very finely sliced. Also I seem to have put too much sugar on the orange slices. If your oranges are not as sweet as mine than this might be a good idea, otherwise sprinkle the sugar very sparingly. I think this would be refreshing on a hot day and even in the winter it is a bit of summer if you don’t mind a cold dessert. Pour one pint of boiling water over two cupfuls of sugar and one lemon cut very fine. Wet three tablespoonfuls of corn starch with a little milk and stir in. Let it come to a boil, simmer five minutes, slice four oranges and lay in a glass dish, scatter over them a little starch when cool, whip the whites of two eggs with a little sugar, flavor with lemon essence, pour over the top and let get icy cold. What to make today? I’m home from work and not very inspired. I have a craving for cheese something I can’t eat very often. I checked the Cheese section of The New Galt Cook Book (1898) and discovered that I haven’t made Mrs. James Young‘s recipe for Cheese Omelet yet. I’m surprised since I’ve made other omelet recipes but perhaps its due to it being in the cheese section rather than the egg part of the cook book. No matter — it is tonight’s recipe. I had to read this recipe several times to make sense of it. It lists the ingredients at the beginning but the description of putting it together is very disorganized. I measured 1 cup of bread crumbs into a bowl. Next I added a pinch of baking soda to 2 tablespoons of hot water. I measured slightly less than 2 cups of milk and then added the soda water mixture to the milk. I poured the milk over the bread crumbs. In another bowl I whipped 3 eggs and poured them in too. Finally I added slightly less than 1 tablespoon of butter and seasoned with salt and pepper. It was as I was typing this up that I realized the butter was supposed to have been melted. Somehow I mixed that instruction but I probably should have realized it needed to be melted when it didn’t mix in very well. I added 1/2 pound of grated cheese and stirred everything together. I poured the mixture into a greased casserole dish, sprinkled the top with bread crumbs and baked at 375 F. for 20 minutes. I really had no idea how long this should bake but thought I’d start with 20 minutes. I removed the dish of cheese omeletfrom the oven and served myself a portion to taste. Mrs. James Young is a frequent contributor. She is the former Maggie McNaught who married newspaperman James Young. They were a prosperous and prominent couple. This version of cheese omelet is quite good. Despite my aversion to eggs I enjoyed this easy supper dish. It is more like a cheese pudding than an omelet but it is surprisingly good considering it contains such simple ingredients as bread crumbs. I’d make this again partly because I don’t have to pay attention to it while it bakes and I get to eat eggs without the taste of eggs. It does surprise me such simple and economical recipe comes from one of the wealthier contributors but Mrs. James Young contributed other frugal foods. I’ve made several of the recipes in the Biscuits section of the 1898 New Galt Cook Book but for some unknown reason I haven’t tried Mrs. Radford‘s recipe for Tea Biscuits. Tonight I’m going to try this detailed recipe for a simple product. I am going to cut this recipe in half so that I don’t have an abundance of biscuits. I put 2 cups of white flour in a sifter and added 1/2 teaspoon of baking soda and 1 teaspoon of cream of tartar. I sifted them together and then added a little more than 1/2 tablespoon of butter. I rubbed the butter into the flour. Next I added regular milk to make it a stiff batter. I wasn’t sure if these are drop or rolled biscuits but I treated it part way as a rolled biscuit. I took chunks of the dough and rolled it and flattened it before placing onto a greased baking pan and baked the biscuits for 20 minutes at 375 F. They had risen and were browning round the edges when I removed them from the oven. It was time to taste. Mrs. Radford is probably Mary Robertson Phillip. She was born in 1865 in Galt and was just 17 when she married Joseph Henry Radford in 1882. He was a doctor and you can read all about him here since he was inducted into the Cambridge Hall of Fame for his service to the community. This write up mentions that Mr. Radford went to Winnipeg for a bit to look into setting up a practice. Did Mrs. Radford go too or did she stay at home? Was she his nurse when he got typhoid fever? Was she ever worried about him bringing home contagion to their two children. The best thing about these biscuits is the description about how to make biscuits. There’s nothing wrong with them but they aren’t anything special either. Measure out four cupfuls of patent process flour, put in a sieve, add to the flour an even teaspoonful of soda and two teaspoonfuls of cream tartar and sift the whole through the sieve twice. Rub through the dry ingredients a large tablespoonful of butter. Rub butter thoroughly through the flour. The longer the shortening is mixed the more delicate the biscuit. Mix into the flour and butter just enough sweet milk to make a batter as stiff as it can be stirred. It must be almost a dough, yet not dry. The longer the soda and cream tartar are mixed through the flour the better the biscuit will be. Bake twenty minutes in a hot oven. Well, here we are at day 330. It’s been a while since I looked at the Salads section of The New Galt Cook Book (1898), probably because I tend to think of salads as a summer food. However, several of the salads in the cook book could be eaten anytime. The Potato Salad recipe I’m going to make tonight is such an example. The recipe was contributed by Mrs. Richard Jaffray and Mrs. Sylvester. I have some potatoes already boiled so the first step is to slice them. Then I’m going to make the dressing so it has time to cool. However, I only have 3 potatoes so I’m going to cut this recipe. I beat1 egg and then sprinkled in some salt, pepper, sugar, and a dollop of prepared mustard. I poured a small amount of vinegar in and then some hot water. I cooked it until it was like custard before I added some cream. I set it aside to cool. I minced up a bit of onion and found some walnuts. I’m ready to put this all together. First I put some sliced potatoes in and then a bit of onion, dressing and potatoes and finally walnuts. I didn’t bother garnishing it with anything other than walnuts since I don’t like pickles or cucumbers. My cold place is the fridge. It is time to taste. This is one of the recipes affected by the editors’ decision to eliminate duplicates for the 1898 edition of The Galt Cook Book. Therefore, it is attributed to two women. Mrs. Richard Jaffray and Mrs. Sylvester. Mary Havel (or Havill) was born in 1848 in Galt. Around 1870 she married Richard Jaffray and they had three daughters. He died the year this cookbook was published and Mary remained a widow for the rest of her life. She died in 1922. My dressing was a bit odd but I like the addition of walnuts in my potato salad. It provides crunch and protein. Someday I’m going to try the dressing again and keep better track of the amounts I used. This salad would look nice in a glass bowl. Take eight or ten potatoes, boiled, slice very thin, and have ready some blanched almonds or shelled walnuts (about a large half cupful), slice a piece of onion very fine or grate it. A salad dressing made of three eggs (well beaten), mustard, pepper, vinegar, sugar and salt to taste; stir in hot water until thick as custard, then add rich cream; put a layer of potatoes, just a sprinkle of onion, then dressing, then potatoes, then walnut, dressing until your dish is full; garnish with cucumber, pickle and walnuts, or nuts alone. Put on ice or in a very cold place until required. I’m going to start this with a disclaimer. I am making a recipe completely out of season. I vowed that I would only use ingredients available when I prepare the recipes in The New Galt Cook Book (1898) but it is extremely unlike that fresh cherries with stems would be available at the end of November in Waterloo County. However, I somehow missed the recipe for Cherry Cakes during that oh so brief season of ripe and local cherries. In the 21st century we can buy cherries year round. I saw some from Chile tonight so I decided to buy them and make A. W. K. of Preston’s recipe from the Fritters section of the cookbook. I decided to cut this recipe to one third of the original version. I beat 1 egg before I added 1/3 cup of water and 1/3 cup of white wine. I melted a bit of butter and poured it into the batter along with some sugar. I forgot to add the cinnamon before I added flour. I mixed it up until it looked like thin pancake batter. I already had the lard heating on the stove. I dropped a bit o the batter into the fat to see if it was ready. I bundled 5 sweet cherries and hung onto the stems as I dipped them in the batter. I dropped them into the fat and waited until they were starting to get golden before I pulled them out and put some sugar on top. Most of the batter had slid off the cherries so I added more flour to the batter and tried again. This time the batter covered the cherries and stayed on for the entire frying time. This bundle got the same treatment. It was time to tasted my cherry cakes. A.W.K. of Preston is a mystery to me. I don’t know her identity (I’m assuming it is a woman). When it comes to investigating the availability of various ingredients in 1898 I have been turning to The Canadian Grocer magazine. This trade journal for merchants was published in London Ontario and is a wealth of information about products, prices and selling techniques for the late 19th and early 20th century. Here’s a link to the January to June 1898 editions. I consulted the July to December magazines and found that canned cherries and evaporated cherries were available. I’d assumed that evaporated fruits would be the same as dried but they are listed separately. The season for fresh cherries was extended well into August with imports from California and Oregon as well as Nova Scotia. I didn’t make perfect cherry cakes but I still liked this recipe. The batter is far more interesting than most used for fritters and it tastes good combined with cherries. The challenge is getting the right amount of flour so that the batter will stick to the cherries. I even liked the batter fried on its own. I made myself a nice long simmering round steak with potatoes and other things. Opening a fresh bag of potatoes inspired me to make the Hashed Potatoes recipe in the 1898 New Galt Cook Book since I wanted to have some potatoes for supper. The recipe was contributed by Mrs. Robertson of Woodstock. I boiled 6 potatoes but decided just to use 3 for this recipe. I had peeled them before I boiled the potatoes in salted water. I chopped them very small and added some salt and pepper. I used a bit of beef stock left from preparing the steak. I added some finely chopped onion as well. I mixed everything together and then melted some butter in a frying pan on top of the stove. When it was nice and hot I poured in the potato mixture and patted it flat in the pan. I assumed that the recipe meant the potatoes shouldn’t cook too fast so I kept the heat on medium. I didn’t have any idea how long it would take for the potatoes to brown on the bottom so I kept peeking. It took much longer than I expected and in the end I didn’t exactly have one solid mass of browned potatoes. Instead my peeking meant I’d broken up the potatoes quite a bit. In the end I had something resembling hashed brown potatoes. It was time to taste. One of the best recipes I’ve made so far was contributed by Mrs. Robertson of Woodstock. I made her wonderful chocolate pie about a month ago on day 295 but I’m still not certain about her identity. She could be Jessie Fisher, a woman who was married to storekeeper George E. Robertson. However, there are several Mrs. Robertson’s in Woodstock in the 1890s. Potato varieties in the Peter Henderson seed catalogue 1898. 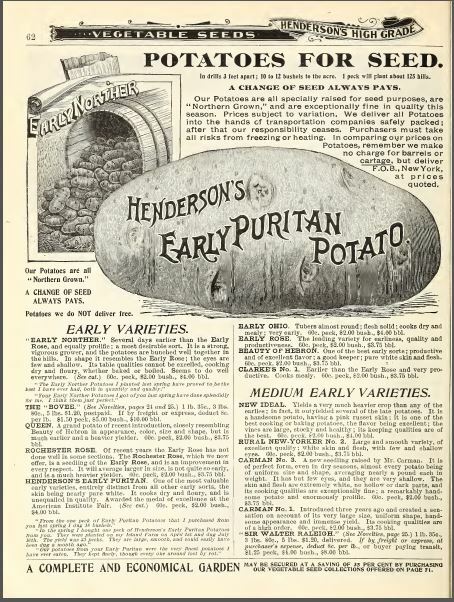 There were many different varieties of potatoes available to the home gardener in 1898. It can be challenging today to find seed potatoes to grow and the potato varieties available at the grocery store are limited to white, red and Yukon gold (a newer type that didn’t exist in the 1890s). I buy white or Russets when I can find them both for my personal use and when I try historic recipes. It’s great when I get a chance to cook with heritage varieties but that opportunity doesn’t come along very often. Hashed Potatoes are good even though I wasn’t able to make them exactly as described in the recipe. I really liked the addition of onion and the crispy bits of fried potatoes are one of my favourite tastes. The beef stock enhances the potatoes and makes them just a bit different from the usual fried potatoes.I’ll try making this again and I’ll try to be patient so that it cooks in a more solid piece. Take six cold boiled new potatoes, mince them and season them with salt and pepper, adding a little milk, or a little stock, as you prefer. A scant half cupful of liquid is generally sufficient. Melt a tablespoonful of butter in an omelet pan and when the pan is very hot pour in the potatoes. Spread them evenly, and set them a little back on the stove or in the oven, well covered, to brown. When they are a golden brown on the bottom, fold them over like an omelet and serve. The addition of a little parsley minced or a teaspoonful of onion, gives a new zest to this dish.